I picked up this Eden pasta at the health food store. 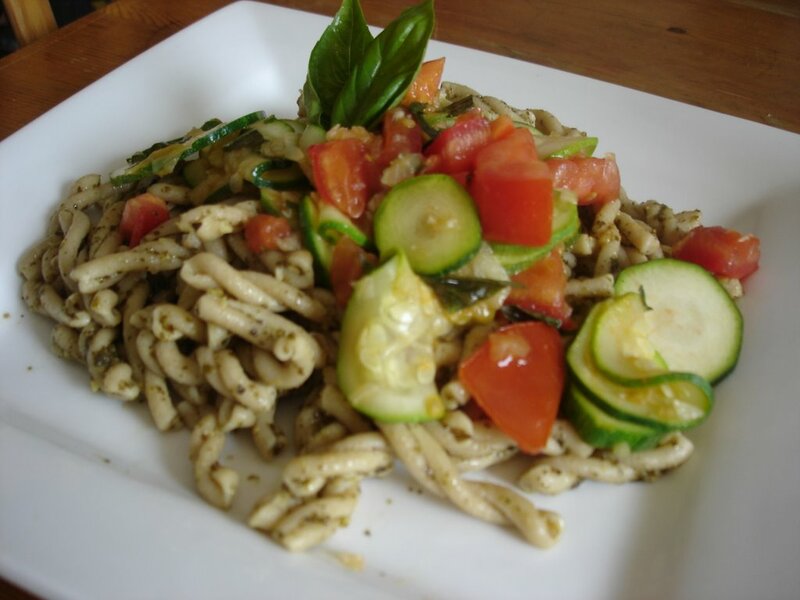 I love alternative grains from the traditional whole wheat and multigrain varieties of pastas. Kamut is a relative of durum wheat but with 20-40% more protein, and is also higher in lipids, amino acids and vitamins and minerals. It is a great alternative to wheat. This was a delicious pasta topped with fresh veggies and a pesto sauce. We're off camping for a few days. I'll see you all soon. I didn't know Eden made a Kamut and Quinoa blend pasta. Thanks for the heads up. I like the Eden Kamut Spirals a lot. Have fun camping!! Still can't get emails through. Thanks for the comments I'll talk to you when you get back. I'm just starting to try pasta made from different grains. There's lots to choose from! Have a great long weekend. Are you headed north? I heard some places have lost electricity because of the crazy high winds the other night. I think they were trying very hard to get everything in working order for the weekend. I hope it's not hot! I've also tried Eden's Kamut spirals, and really like it. I'm eager to try other Eden pastas including this kamut and quinoa version. It's great that there are so many whole grain alternatives to whole wheat pasta. Oh, kamut. I've heard of that grain. Nice. I shall look for Eden brand, as i do like a lot of their stuff! Have a great time camping!! (Or maybe it's more like i hope you had a wonderful camping adventure, by the time you read this.) I am going camping in less than 2 weeks also! Nice summer meal. Sooo healthy--good for you! Thank you all for the camping wishes. I am back. We had a great time. Weather was perfect. I am glad to be home. Camping cooking leaves a lot to be desired. One night hubby was video taping at dinner and I was saying, "If that ends up on my blog, there will be consequences" The dinner was so disgusting that none of us could eat it. Thank goodness for ice cream cones! Hey I am glad you had a good time camping. You shouldn't try fine dining on an open fire that is what they invented smores for! Thanks for the birthday wished I had a great day my man spoiled me rotten.